I'm excited for this, even though I'm not sure what it is. 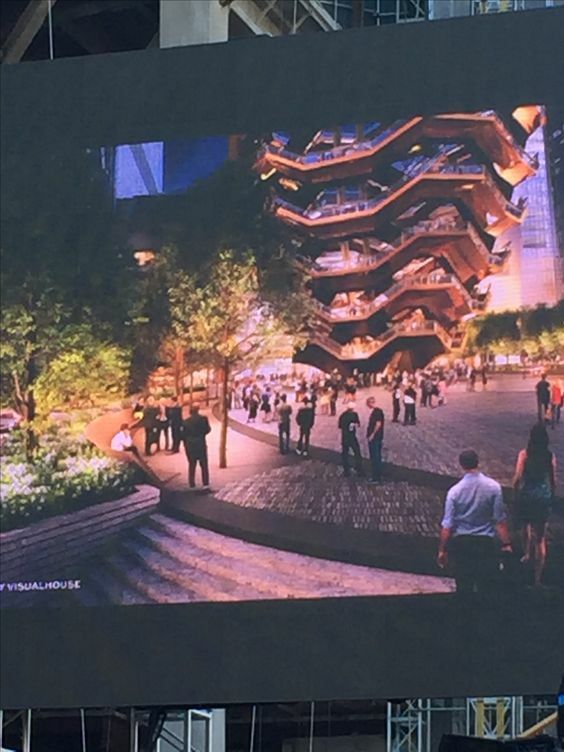 But it's clear that the Hudson Yards won't just be a collection of skyscrapers. 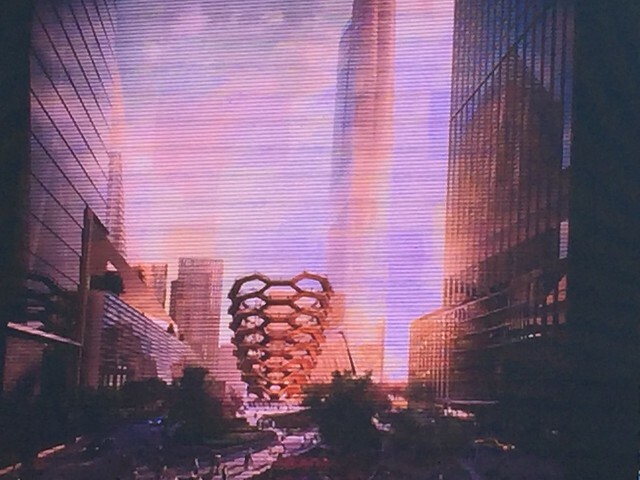 The Thomas Heatherwick sculpture that will grace the public plaza at Hudson Yards will cost $200 million and “will become to New York what the Eiffel Tower is to Paris," said Hudson Yards developer Stephen Ross on Monday. Its design has been shrouded in secrecy, and will "hopefully," remain so at least until September, Ross said. That's when the developer expects to unveil the design of a sculpture poised to ocupy a plaza "bigger than Trafalgar Square." 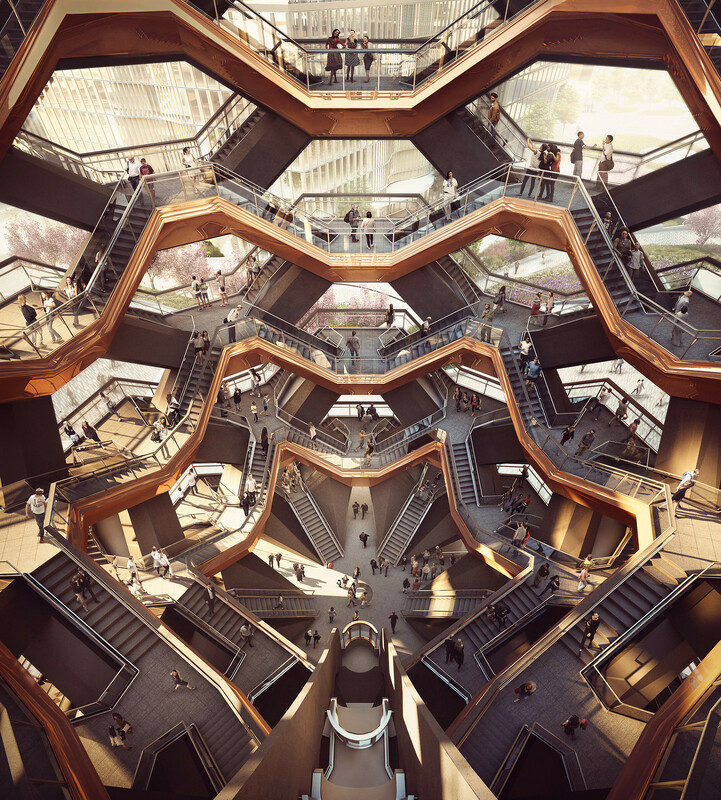 Citing a source who saw the Heatherwick design, in 2015 a New York Times critic said that Heatherwick "envisioned a 'vessel' that could occupy a large part of the plaza, shot through with dozens of stairways. 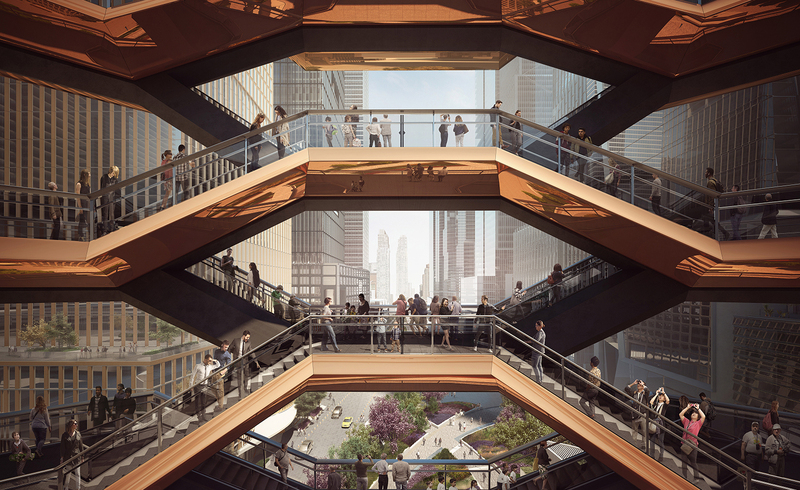 Shaped like a chalice, it would rise higher than the adjacent, cavernous Culture Shed, the 100-foot-high international arts center also planned for Hudson Yards." Construction is expected to be complete in 2018. Heatherwick is also designing Pier55, the Barry Diller-funded island off Hudson River Park. In 2013, Ross put the Heatherwick price tag at up to $75 million. He made today's cost estimate at a breakfast hosted by Crain's New York. 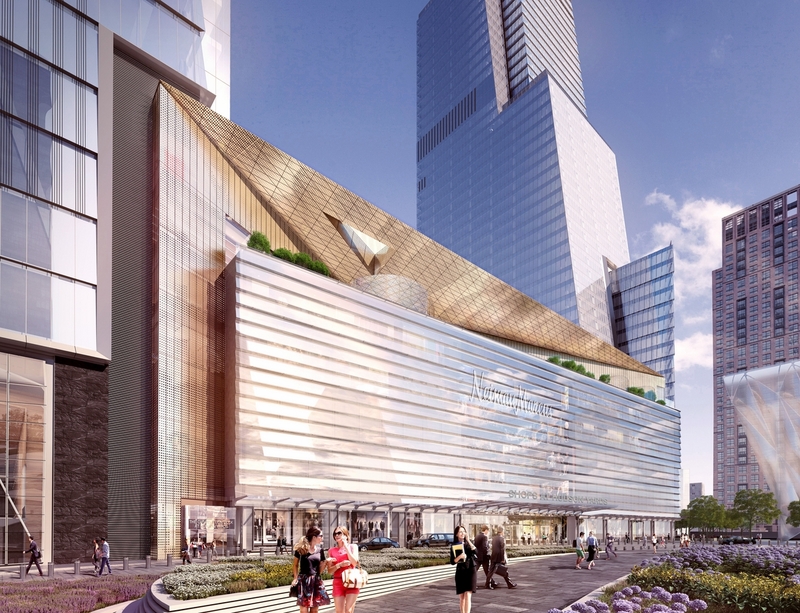 According to a recent study, economic activity at the $20 billion Hudson Yards West Side development–the nation’s largest construction site–will contribute $18.9 billion to the city–more than the gross domestic product of Iceland ($15.3 billion), Crains reports. The study, commissioned by the project’s developer, Related Cos., predicts that the companies projected to occupy the massive project that will stretch between West 30th Street and West 34th Street along the Hudson River will generate economic activty in the form of, among other things, salaries for new jobs and money paid to the MTA by the developer both during the 14-year construction period and once the development is complete in 2025. According to the study, “Three years into a 14-year construction program…the bet is beginning to pay off.” The project includes 10.4 million square feet of office space, eight residential buildings, retail and a cultural center. The report estimated that 2,767 construction jobs would be created each year during the build-out period. 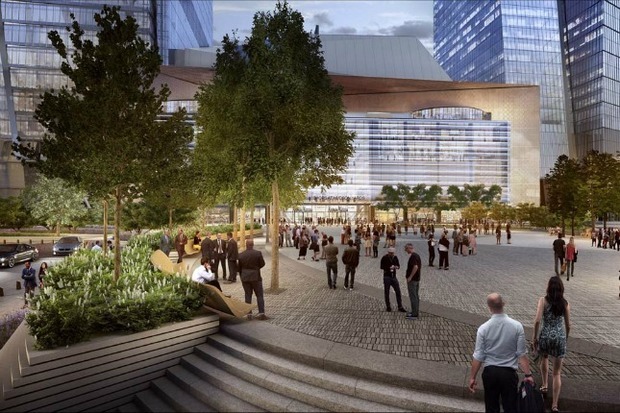 Once complete, Hudson Yards is expected to employ 56,000 full-time employees earning $9.8 billion annually in total (an average of over $175,000 per worker). The Metropolitan Transportation Authority, which owns the rail yards above which most of Hudson Yards will be built, will receive a total of $1.8 billion in lease payments from Related during the build-out period, and payments of $89 million annually once the project is complete, in addition to $68 million annually as payments in lieu of taxes that the city will use to pay down its debt service for the No. 7 train extension which opened late last year. Ross also said earlier that the structure would "contain more people" than the Eiffel Tower. Still trying to get a visual on it, but with the steady stream of people coming from the High Line alone, this will become a major draw. His latest project for the Hudson Yards on the Far West Side of Manhattan may become a new city landmark; for now it remains shrouded in secrecy. 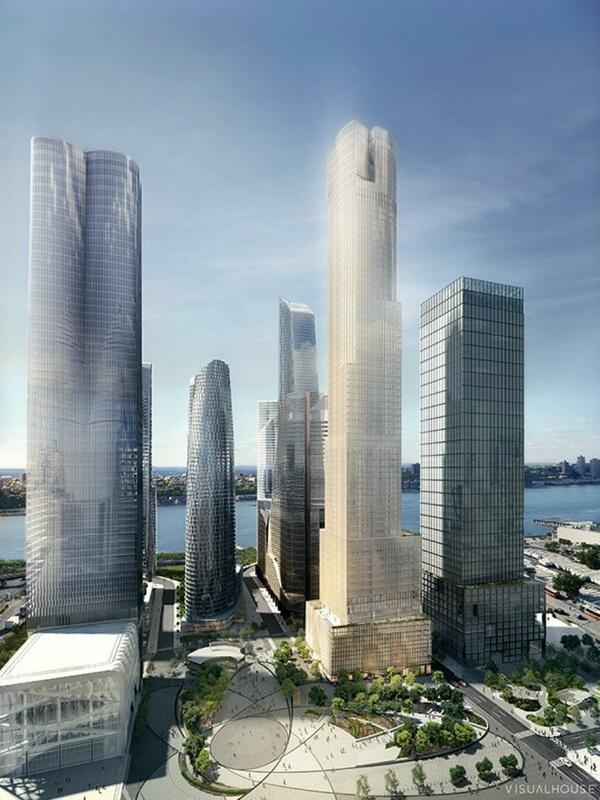 Stephen M. Ross, chairman of Related Companies, a Hudson Yards developer, compared it to the Eiffel Tower in Fortune magazine two years ago, but one person who saw the design at that time described a concept much more grandiose than the developers’ original idea for a sculpture on a plaza fronting Hudson Yards’ vertical mall. 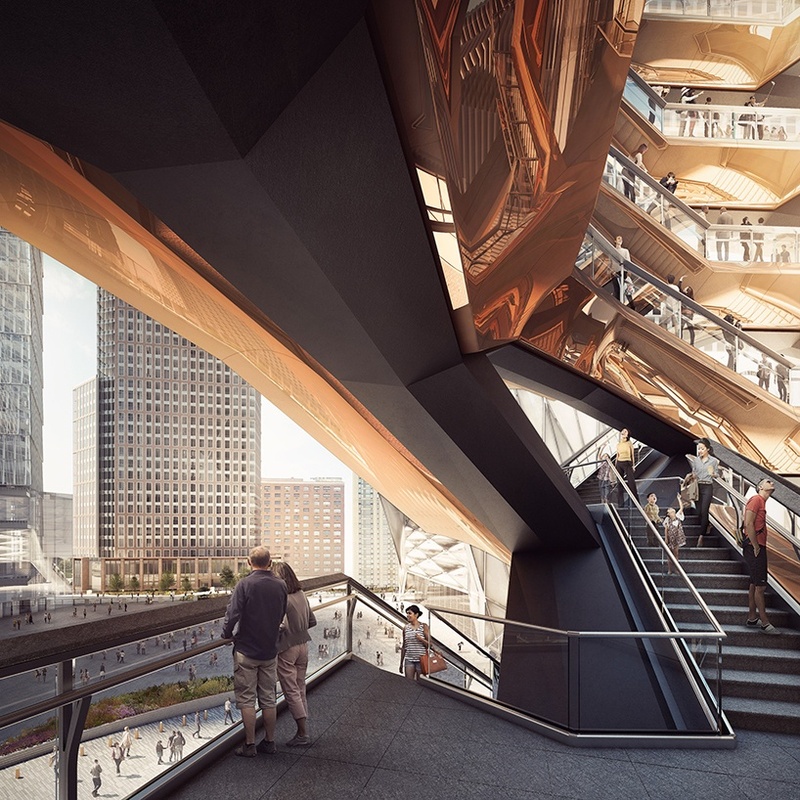 Mr. Heatherwick envisioned a “vessel” that could occupy a large part of the plaza, shot through with dozens of stairways. Shaped like a chalice, it would rise higher than the adjacent, cavernous Culture Shed, the 100-foot-high international arts center also planned for Hudson Yards. Related and the co-developer, Oxford Properties, refuse to discuss Mr. Heatherwick’s design. A $200 million sculpture coming to a plaza in the Hudson Yards could become the Big Apple's answer to the Eiffel Tower, a developer said on Monday. Speaking at a Crain’s real estate conference, Related Companies Chairman Stephen Ross said he believes the yet-to-be-revealed sculpture designed by British artist Thomas Heatherwick will “become to New York what the Eiffel Tower is to Paris,” Crain’s New York reported. Back in 2013, Ross — whose firm, along with Oxford Properties Group, is developing part of the Hudson Yards on Manhattan’s West Side — estimated the sculpture would cost about $75 million. Heatherwick’s studio has designed a number of high-profile projects, including the Olympic Cauldron at the 2012 Olympic Games in London and the Shanghai World Expo 2010’s “UK Pavilion,” according to his website. “It will be very iconic… very bold statements, I know that,” Ross reportedly said. He added that the sculpture’s design will “hopefully” remain under wraps until September or later, Politico New York reported. 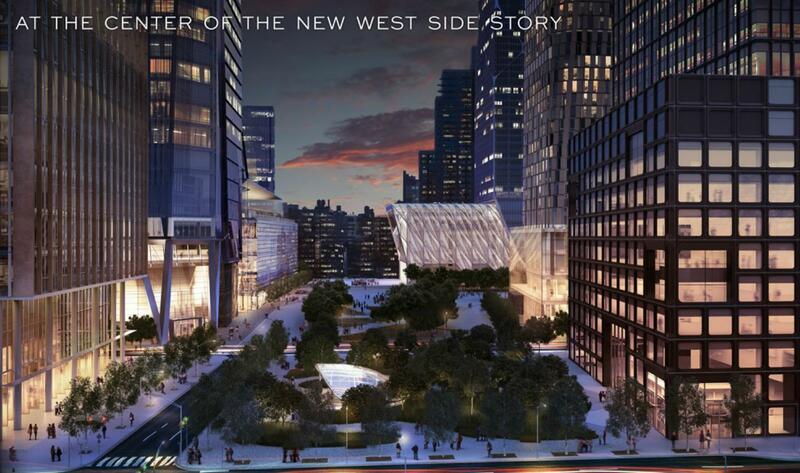 The plaza where it will reside will be “bigger than Trafalgar Square” in London, Ross said. Big, bold and basket-shaped, the structure, “Vessel,” stands 15 stories, weighs 600 tons and is filled with 2,500 climbable steps. 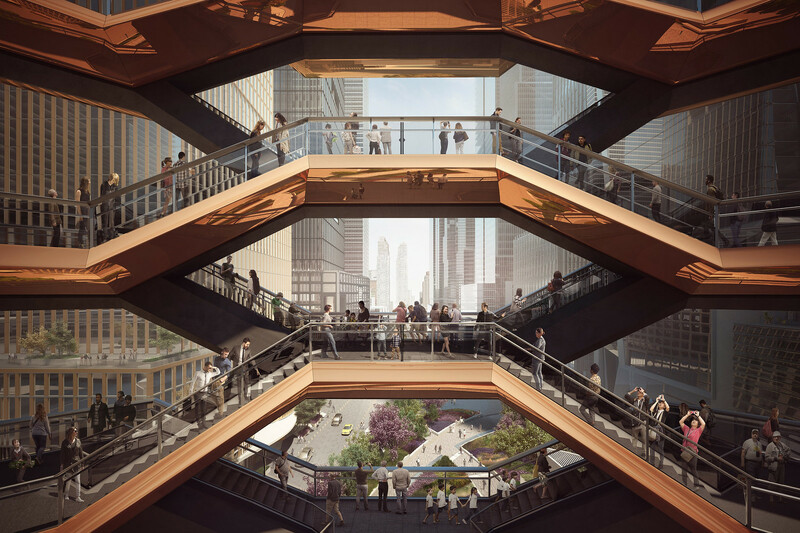 Long under wraps, it is the creation of Thomas Heatherwick, 46, an acclaimed and controversial British designer, and will rise in the mammoth Far West Side development Hudson Yards, anchoring a five-acre plaza and garden that will not open until 2018. Some may see a jungle gym, others a honeycomb. 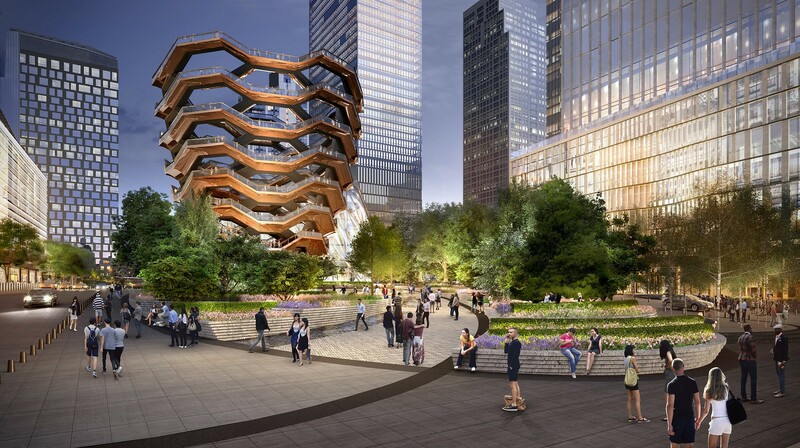 ...Currently under construction in Monfalcone, Italy, the bronzed-steel and concrete pieces that make up “Vessel” are not to be assembled on site until next year, but on Wednesday, Related Companies is rolling out the design with a splashy Hudson Yards event. 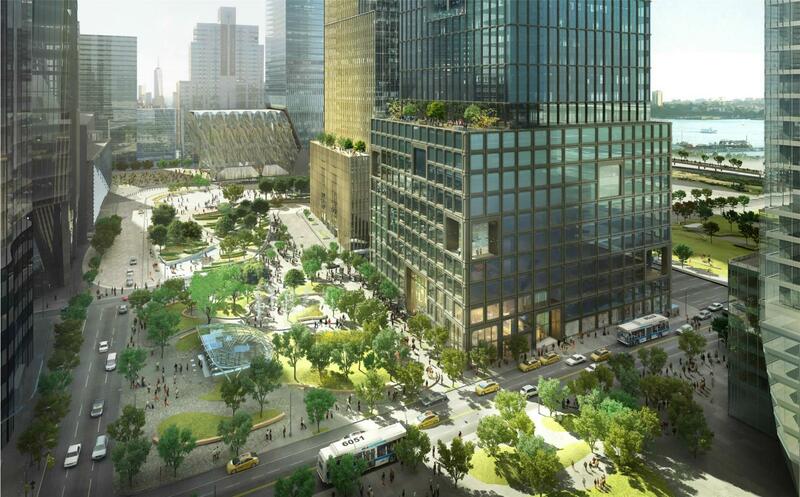 It was perhaps the greatest mystery in the world of urban design–what exactly was the great monument that Stephen Ross pledged to plant in the gigantic public plaza of the Hudson Yards? For years, it was well known that Ross, founder and chairman of the Related Companies, was auditioning almost a dozen of the world’s top sculptors and designers for the job, a list rumored to include Maya Lin, Richard Serra, Jeff Koons, and Zaha Hadid. And Ross himself was promising a one-of-a-kind spectacular that would dwarf any public monument Manhattan had welcomed in decades, and reign as an irresistible magnet for tourists from around the globe. At 11:30 a.m. on September 14 (the precise time this story first appeared), Ross unveiled the plans for the project at an extravaganza in at a nearby park attended by New York Mayor Bill de Blasio, and featuring a dance performance conceived for the occasion by the Alvin Ailey troupe. The drawings and models display something on a scale exceeding, in cost, size and engineering complexity, any public monument furnished by a private developer in modern times. As it turns out, the work isn’t a sculpture as you might expect, but a towering, bowl-shaped lattice of circular staircases designed by Britain’s Thomas Heatherwick, a specialist in big public installations who created the famous flaming cauldron that symbolized the 2012 London Olympics, and is helping design the reimagined Google campus in Silicon Valley. The structure, named “Vessel” by Heatherwick, fans out from a relatively small base like a Grecian urn, ascending 150 feet or the equivalent of 15 stories, its polished, copper-colored stainless steel skin reflecting the images of the folks strolling in the plaza below. If all goes as planned, it’ll open to the public in late 2018. It’s not just meant to be ogled, but trod upon. “Vessel” is a sort of a towering jungle gym. Young and old alike will climb 2,500 steps over 154 flights of stairs, connected by 80 landings festooned with benches from which visitors can enjoy Hudson River views. Visitors will walk a full mile when making the round trip from the plaza to the summit and back. The cost, fully paid by the developers: $200 million. Last edited by NYguy; Sep 14, 2016 at 6:04 PM. Holy.... this is indeed iconic, and has an elegance that I didn't see in Anish Kapoor's monstrous London tower. It's not easy to just create another Eiffel Tower... especially when China or Dubai will just do it bigger and faster. Pretty cool Escher inspiration, as well. I was worried it might be too big and overwhelm the plaza, but its just right. Looks like a beehive, I'd know since I cleared a few of them out my summer home's wood shed a few weeks ago. For the last couple years, I have been curious how they could fit an Eiffel Tower-like icon in the middle of this plaza. Now we have an answer. You can't. Of course you can't. Not that this isn't great. It is. But it ain't no Eiffel Tower. Not remotely close. Always better to under-promise and over-deliver rather than the other way around. Doesn't have to be the same size as the Eiffel Tower to be equally iconic, though I don't think this is or will be. It's growing on me. I think I like it. I look forward to seeing the finished result in person. Right, that was never a reference to height. That would be absurd, considering it will be surrounded by towers as tall or taller than the Eiffel Tower. 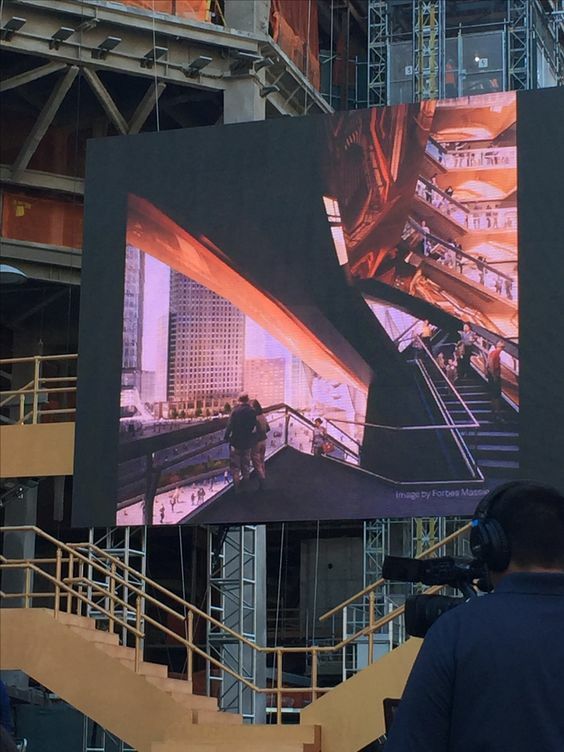 It will be an iconic structure/structure that will come to symbolize the new New York of the Hudson Yards. The area, already flowibg with tourists due to it's connection to the High Line, will become one of the must see destinations. It will be something you can experience, rather than just look at. New York is lucky enough to have multiple such icons- the Statue of Liberty, Empire State Building, Brooklyn Bridge, etc. This, along with others such as the NY Wheel, will be among the new icons of this century. There was a New York that existed before those older icons. But we can only imagine NY with them now. It will be no different for the new.